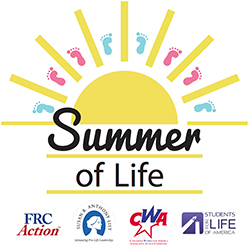 Washington, D.C. – Today, the national pro-life groups Concerned Women for America Legislative Action Committee, Family Research Council Action, Students for Life of America, and the Susan B. Anthony List announced the launch of a multistate “Summer of Life” campaign to bring awareness to the Pain-Capable Unborn Child Protection Act. The legislation, which would limit abortions after 5 months, more than halfway through pregnancy, has wide spread support and was passed in the House over a year ago. The opportunity now falls to the Senate. That opportunity has been stonewalled by Majority Harry Reid (D-Nevada) and other Democrats who refuse to support the bipartisan measure. The rallies will call on Sen. Michael Bennet (D-Colorado), Mark Udall (D-Colorado), Kay Hagan (D-North Carolina), Mark Pryor (D-Arizona), and Mary Landrieu (D-Louisiana) to listen to their constituents and support the Pain-Capable Unborn Child Protection Act, S. 1670. The United States is one of just seven countries worldwide that permits abortion beyond 20 weeks, when an unborn baby feels pain, can acknowledge its mother’s voice, hiccup, and grow hair. The other countries include: China, North Korea, Vietnam, Singapore, Canada, and the Netherlands. National polling by Quinnipiac, National Journal, Huffington Post, NBC/Wall Street Journal, and Washington Post/ABC News all found that a plurality or majority of Americans support limiting abortion after 20 weeks and that women support the measure in higher proportions than men.